To be eligible, you would have to be a full-time clerk in the site installation to receive a credit for a specific pay period identified in the date range listed for each site. Each employee would have total credits listed on the right hand side of the report. A PSE converted to full-time would only start receiving credits once they became a full-time clerk in the SRT site installation and it would have to be during the grievance period. A full-time clerk in the SRT installation that retired before the grievance period would not received any credits. The value for each credit will be determined at a later date, no earlier than August 4, 2018. 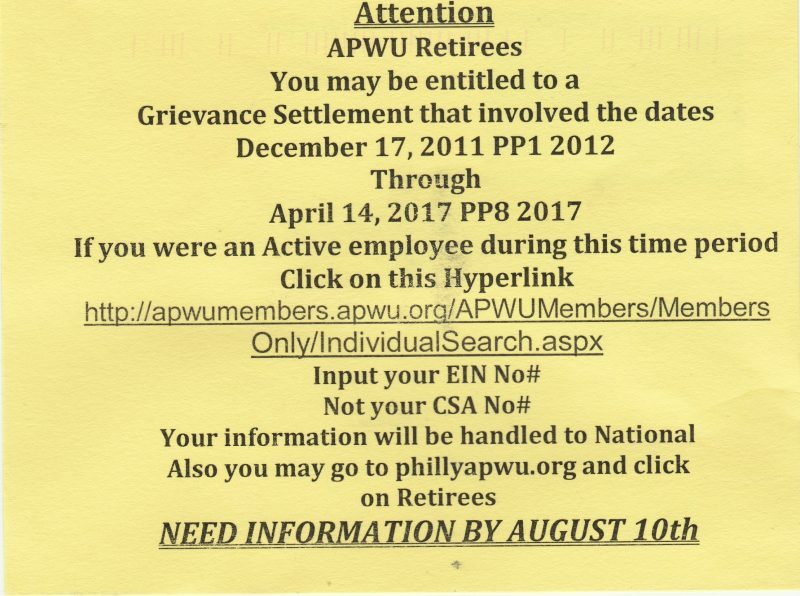 This entry was posted in Clerk Business, General Union Business, Retiree Business and tagged APWU Clerk Craft, APWU retirees, Grievance Payout, Sales Retention Team, SRT. Bookmark the permalink. My name is Ronald L. McMurray and my address is 9546 south Yates Chicago Illinois 60617. I’m one of the former Fox Valley employees who was entitled to a SRT payment and have yet not received mine while most of, If not all, current and former Fox Valley employees have received theirs. If you can help or advise, please comment here or contact me at djronniemac@gmail.com and/or my phone number at 773-443-4009.